Margaret Ritchie MP and the Chairperson of Down District Council, Michael Coogan launched Amnesty International’s “Purple Finger” campaign in the St Patrick Square on International Women’s Day on Friday 8 March. The Mid-Down Group of Amnesty International, based in Downpatrick, set up its “Purple Finger” petition to ask the UK government to make women’s rights a priority in its work onAfghanistan as the deadline looms for the withdrawal of British military forces at the end of 2014. 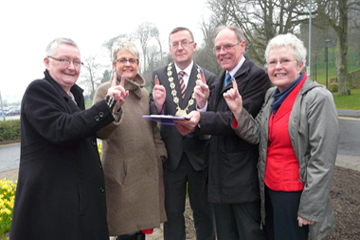 Margaret McMahon, Amnesty International Mid Down member, South Down MP Maragert Ritchie, Down District Council Chairman Councillor Mickey Coogan, Philip Nye, Chairperson of Amnesty International Mid Down branch, and Lilian Nye, Mid Down member, pictured in St Patrick’s Square in Downpatrick celebrating Women’s Day 2013 by launching the ‘purple finger’ campaign. The purple finger symbol, a reflection of how voting is recorded in Afghanistan, is being used as an image of Afghan women’s empowerment and Amnesty is asking people to put their own purple fingerprint on the petition to the Department for International Development. The petition asks the DIFD to ensure that combating violence against women is made a UK priority in Afghanistan. Philip Nye, Chairperson of the Mid-Down Group, said: “After the dark years of Taleban rule and years of terrible conflict, now is the time for the UK to stand up for women’s rights in Afghanistan. There have been significant improvements for women and girls there since 2001, with new anti-violence laws passed. Some 2.5 million girls have enrolled in schools and women taking an active role in public life, including 27% of MPs in the Afghan parliament. “However, there has been an upsurge of targeted killings and attacks on schoolgirls and their teachers by the Taliban. Meanwhile the Afghan government’s 70-strong High Peace Council set up to negotiate a possible peace deal with the Taliban, has only nine women in it. There are real fears that women’s rights might be traded away and for things to go backwards”. Amnesty International, Mid-Down Group, meet on the first Thursday of each month at 8.00 pm at the Mill Ballydugan. New members are always welcome. 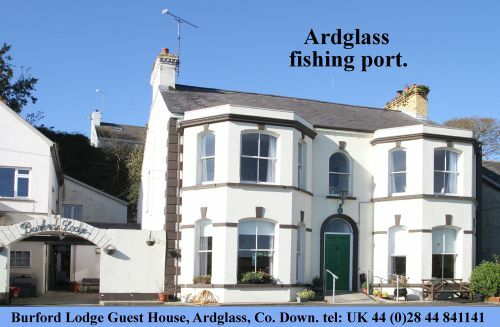 ( Contact Philip Nye, Chairperson on , on 028 4485 1920. Across Northern Ireland there were many events to celebrate Women’s Day. Junior Ministers Jennifer McCann and Jonathan Bell opened a reception hosted by the Egyptian Society to celebrate International Women’s Day in Parliament Buildings, Stormont. The Office of the First Minister and Deputy First Minister has lead responsibility for promoting gender equality across government. Speaking at the reception Junior Minister Jennifer McCann said: “International Women’s Day is a day on which to reflect on the position of women in our society, past, present and future. I welcome the work of the Egyptian society and its efforts to promote the integration of Egyptian and Arab families within our community. Junior Minister Jonathan Bell added: “It’s nearly a century since women in the United Kingdom first received the right to vote. It’s less than a century since some organisations, including government, obliged married women to leave their jobs. The United Nations will shortly examine the United Kingdom, centrally and at devolved administration level, in terms of its obligations under the 1979 Convention on the Elimination of all forms of Discrimination against women (CEDAW). The event was attended by Mr Ashraf Elkholy, Egypt’s Ambassador to the United Kingdom.